Cummins Filtration has a long history of providing innovative technology and premium products. With this in mind, Fleetguard embarked on a value-add improvement project with a key mining customer and an oil giant to increase the oil-drain intervals on a specific fleet of Rigid Dump Trucks (RDTs) operating at the Tharisa open-pit PGM and chrome mine near Marikana in the North West Province. The main aim was to reduce downtime and unlock significant cost-savings across the entire fleet for the mine operator. Tharisa Mine Technical Operations Manager Stephen Watson explains that, while the project was scoped initially with Fleetguard and Shell Downstream South Africa to increase the RDT oil-drain interval from 500 hours to 1 000 hours, this milestone was achieved successfully. “Tharisa Mine takes this opportunity to thank its partners in achieving these significant targets,” he comments. The field trial is ongoing on the remainder of the fleet, with the oil-drain intervals being ramped up to 1 500, 1 750 and, ultimately, an astonishing 2 000 hours. “Cummins Filtration realises that its customers rely on us after the sale as much as when they place their initial order. Our commitment is to meet our customers’ needs beyond the sale with world-class service. We do this by creating processes that commence by listening to our customers, and then implementing the best solution possible, based on lean organisation principles and continuous improvement tools and techniques. 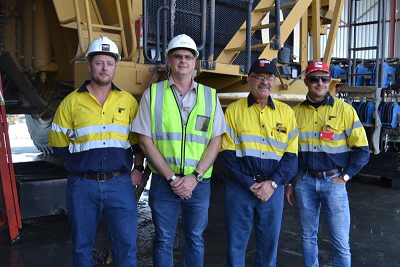 It was our privilege to participate in this unique field trial with Tharisa Mine, across a broad spectrum of equipment, including RDTs and mining shovels,” Filtration Operations and Technical Support Manager: Africa Raymond Liversage comments. Tharisa Mine embarked on the project in order to improve fleet availability and reliability, and also to reduce overall maintenance costs. As part of this process, following extensive engineering and commercial assessments, increasing oil-drain intervals was identified as the key driver, with the highest potential to achieve the mine’s efficiency and productivity goals. “What we wanted was to create an entire ecosystem. We engaged with all of our partners, and walked them through our value-upliftment strategy. We required our partners to examine our RDT fleet status and determine the best product solution available to suit our needs. This then allowed us to calculate the estimated cost-savings. These calculations formed the basis for the final partner listing,” Watson elaborates. 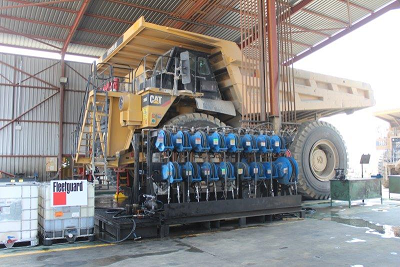 Tharisa Mine partnered with Cummins South Africa and Cummins Filtration, which manufactured and supplied the Fleetguard filtration requirements, as well as Shell Downstream South Africa, a manufacturer and supplier of synthetic lubricants. In addition, WearCheck provided oil analysis at regular intervals in order to ascertain wear, contamination levels, and oil condition in all oil-wetted components or oil filters. The agreement included OEM components, specifically where a suitable product had not yet been developed to match the specifications required. Cummins was also required to package and deliver service kits with all necessary replacement parts for each service interval. With filtration representing about 10% of the mine’s total fleet cost, the savings generated by implementing a 1 000 hour oil-drain interval have been calculated at nearly R23 million across a fleet of 50 trucks over a 12-month period. “What was fantastic for us was that here was a customer prepared to let us push our products to their limit, as they wanted to realise maximum long-term benefits. These machines are highly capital-intensive, so putting them on the line is testament to the faith displayed in Cummins,” Liversage stresses. “We effectively selected the harshest mine site in the stable. Initially the plan was to select five machines only, but we ended up running 30 trial machines at once, including different models. While the field trial has exceeded its benchmarks, it is still ongoing as a result of the excellent performance and reliability delivered by all of the suppliers involved,” Watson highlights. While Tharisa Mine would ultimately have a Fleetguard solution across its entire fleet, Cummins also engineered specific products that were best-suited for this specific application. These were manufactured, tested in the Tharisa Mine fleet, and then submitted to Cummins India for comprehensive testing and report-back. Watson reveals that Tharisa Mine is also in the process of installing sensors on its fleet to enable real-time monitoring. The results of the field trial will be communicated to Cummins globally, and eventually translate into new product developments and refinements. “We have a global release system that will feed these innovations into territories such as Russia and North and South America,” Liversage notes.